It can feel at times like lead generation happens spontaneously. You create your website, push off-site content, make sure your SEO is on point, and the lead just comes rolling in like magic, right? It’s tempting to think it’s that simple, but the fact is that there’s a complex system at work behind the scenes that makes an Internet marketing lead generation campaign work. Those leads don’t just materialize out of nowhere. For Internet marketers, it’s critical to understand how this process works because any disruption in any single component of that process can create serious headaches for you. In turn, leaving your campaign functioning at less-than-full capacity. Here at Straight North, an Internet marketing service based in Chicago, we’ve been fixated on understanding what makes a successful Internet lead generation campaign work to better serve our clients and help them generate the sales leads that will bring them greater success. That means we’ve spent a lot of time taking successful campaigns apart and examining them to get a complete picture of what goes into them and how they all mesh. As a result of our extensive research, we’ve created a visual representation of what we’ve come to know as the ecosystem of Internet marketing lead generation. Although we created this flowchart for internal training purposes at first, we’ve found it to be an invaluable tool for helping our clients understand what they need to have in place for their campaigns to be successful. Like most complex systems, this ecosystem can seem to work like magic at first glance, but delving deeper into its inner workings reveals the true complexity throughout the system. There are so many components that go into the creation of a sales lead on the Internet that it can seem impossible for anyone to understand it completely. For a business trying to enhance its online presence and generate new leads, the complex nature of this ecosystem looks impenetrable at first. Although it’s true that this ecosystem is intricate, understanding it becomes simpler with this visualization. As you can see on the accompanying flowchart, a lead generation campaign consists of numerous elements that all work together to create new sales leads. Each piece of the puzzle serves a specific purpose within the process as a whole. If you attempt to run an Internet marketing campaign without any one of them, you put yourself at risk for having the entire campaign function at far less than peak efficiency or even stop working altogether. 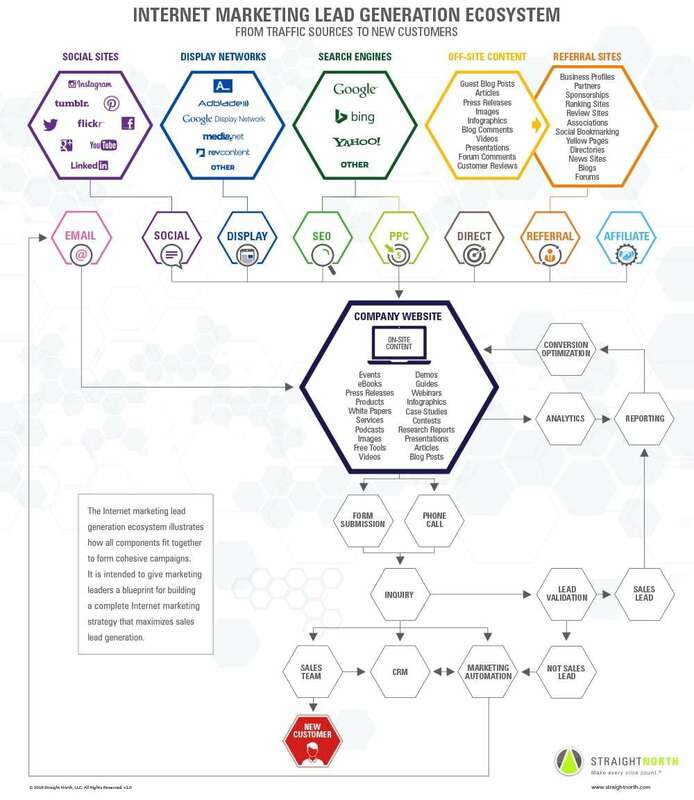 The infographic illustrates how all of the components of the marketing lead generation ecosystem connect to one another, forming a comprehensive and coherent Internet marketing campaign. This could be essential for you as a blueprint for creating a full-featured lead generation campaign that utilizes and optimizes proven sales lead generation strategies. Because there are so many complicated and varied components that go into a successful lead generation campaign, it can be easy for marketing professionals or their clients to overlook or downplay the importance of certain elements. However, they neglect those elements at their own risk, because every one of those components needs to be present and functional to ensure that a campaign is working at its best. For example, omitting the lead validation component leaves a campaign without crucial reporting that is necessary for optimizing it — meaning resources are wasted and potential sales are left behind. If you’re developing an Internet marketing campaign or have one that isn’t operating at its greatest efficiency, keep the following infographic handy. Being able to visualize the ecosystem of lead generation can be essential for ensuring that your campaign isn’t missing any of the important elements. There’s no magic behind generating sales leads, but understanding the process behind a lead generation campaign can help yours run like magic. With more than 25 years of sales and marketing experience, Brad Shorr is Director of Content Strategy at Straight North, a full-service Internet marketing firm that specializes in SEO, PPC and web design. Brad has written for and been featured in leading online business publications, such as Entrepreneur, Forbes and Salesforce.